Virtual Reality has been just around the corner that it's hard to come to terms with the fact that it's going to arrive soon, in a form that you'll actually be able to buy and that won't make you nauseous after a few minutes' immersion. Chances are that your next big hardware purchase could be your very own VR (or AR – more on that later) system, but which one should you go for? Here we take a look at the big players and outline what's on offer. If there's one name that's synonymous with virtual reality at the moment, it's Oculus Rift. Thanks to its original, headline-grabbing appearance as a Kickstarter project, and helped by Id's John Carmack giving it his public backing (he's now Oculus' CTO), Oculus Rift came out of nowhere to become the one VR headset that everyone wanted to own. Getting bought out by Facebook – which notably resulted in Markus 'Notch' Persson announcing that he was cancelling the Rift version of Minecraft – raised the Oculus profile even higher. The other big advantage that Oculus Rift has is that developers have had their hands on the hardware and SDKs for a while and there are already a number of games that support it. Over 100,000 DK2 units have been shipped to developers (and even if you're not a developer you can order one now and get in on the fun ahead of the pack) and while a firm release date has yet to be set for the consumer version, it's generally expected to be on sale this year, and for less than the $350 that you'd pay for a DK2. It should feature a resolution of at least 1920x1080 with a 90Hz refresh rate, with six degrees of freedom – 3-axis rotational tracking and 3-axis positional tracking – as well as integrated HRTF audio, wireless operation and an improved build quality over the development kits. Described as "a full-featured, 360° room-scale VR experience", Valve's SteamVR, developed in partnership with HTC, is a more recent VR offering that appears to have the technical edge over Oculus Rift. The big advantage is the fact that whereas the Rift generally requires you to stay more or less in one place, SteamVR is made for moving around. It manages this thanks to the use of two base stations that you can place in opposite corners of a room, and which will map out the shape of the room and create a virtual space up to 15 foot square that you can safely explore without bumping into walls. Unveiled at this year's Game Developers Conference, SteamVR's headset, the HTC Vive, features over 70 sensors to enable sub-millimetre accuracy in its tracking, and features two 1080x1200 screens with a 90Hz refresh rate. It also has the advantage of coming with its own controllers – a pair of single-handed devices based on Valve's own Steam Controller and designed with VR interaction in mind. Valve has stated that the consumer version will be available to purchase by the end of the year, and it has just opened up applications for developers to order their own development kits. And while the Rift has the head start on available games, SteamVR's free APIs and its ties with Valve's steam system mean that it should quickly catch up. The downside, though, is that you can probably expect to pay more than for the Oculus Rift. Oculus Rift and SteamVR have their differences, but what they both have in common, of course, is the need for a hefty piece of hardware to actually generate their VR worlds. It's all very well having a gaming rig that can run a 1920x1080 monitor at 60fps, but creating an immersive VR experience takes things to a different level. Whether you opt for the Rift or SteamVR, you'll need hardware that can run two high-resolution screens simultaneously at 90fps with minimum latency. Basically, you're going to need a bigger GPU; whether it's something from NVIDIA's GeForce 900 series or AMD's R9 series, you'll want something that can keep pace with your headset without dropping a frame, and which can give you a crisp, anti-aliased image that won't break the illusion of reality. There's another option, though, and while it's not VR it's something that offers an intriguing alternative to the full-on immersive options of Oculus Rift and SteamVR. Microsoft's HoloLens is pitched as "the first fully untethered, see-through holographic computer", and instead of immersing you in your own virtual world, it superimposes high definition 3D imagery onto the real world that you can interact with using hand gestures, similar to those used with Microsoft's Kinect system. If you find the idea of virtual reality a little intimidating – or if you're worried that once you're in you might never want to come out – Microsoft's Augmented Reality headset might just be the thing for you. The big benefit is that for the HoloLens you won't need to splash out for a top-end GPU to run it; instead the HoloLens is a self-contained system that, says Microsoft, contains more computing power than the average laptop. Which, when you think about it, isn't a great amount of power, but considering that it's not having to generate an entire VR environment but instead projects 3D objects on top of your actual surroundings, that may well be more than enough for the job. 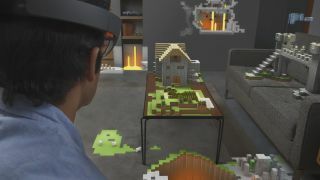 There's no release date for the HoloLens yet, but with support built into Windows 10 – not to mention the seductive possibility of Minecraft projected onto your tabletop, and Unity support just announced – Microsoft could well be onto a winner, assuming the price isn't too prohibitive; we fully expect this to be the most expensive option of the lot.